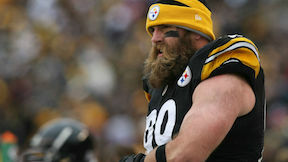 Brett Keisel is a former professional football player. He played twelve seasons with the Pittsburg Steelers, where he was known as “Da Beard.” He grew his beard during a summer hunting trip with his father, and it took on a life of its own. The beard became the source for fan rallies and charitable fundraisers. Kaiser was born on September 19, 1978, in Provo, Utah. He excelled in football, basketball, and track at his high school in Greybull, Wyoming. He lettered four times in football and basketball and twice in track. He was a four-time All-Conference selection and earned All-State honors playing tight end and linebacker. He pursued playing basketball during college, but changed his mind when his research showed him that his size was better suited for playing football at a professional level. He played football for Brigham Young University (where he was red shirted his freshman year), but played his junior year for Snow College. The Pittsburgh Steelers selected him in the seventh round of the 2002 NFL draft. He was sidelined due to shoulder surgery for the 2003 season. By the 2005 season he was playing in every game. In 2006 he won the first team position as right defensive end. In 2010 he made his first career interception and touchdown and was added to the AFC Pro Bowl roster. He played in Super Bowl XL and XLIII. In March 2015, Keisel was released by the Steelers and in June he announced his retirement. Keisel is a member of The Church of Jesus Christ of Latter-day Saints. He married his high school sweetheart, Sarah, and they are the parents of two children. This page was last edited on 1 September 2016, at 11:29.